Properties: - Moderately anti-bacterial. - Relieves muscles which regulate the respiratory tracts. - Mucolytic (breaks-up mucous congestions). Suggested ingredients: An infusion in water and alcohol (from grapes fermentation) of Origanum dayi, mint, eucalyptus, corn hair, clove bud, Fumaria officinalis, savory, wild pansy and Micromeria fruticosa, al and carrot seeds. Usage instructions: For coughing, vocal chords: Spray 2-3 times in mouth (up to 6 times a day) For preventing asthma; after quitting smoking: Spray 2-5 times a day for 3 weeks; resume after 2 weeks of recess. Limitations: Do not use for children aged below 3. Comments: When treating asthma, in the first time use a small quantity to assure absence of allergy to the product. 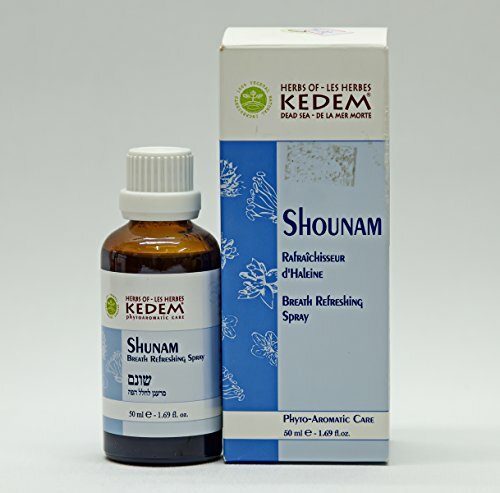 If you have any questions about this product by Shounam, contact us by completing and submitting the form below. If you are looking for a specif part number, please include it with your message.